Northwest Film Forum announces our latest obstruction for the frisky filmmaker: The Pocket Film Challenge-a small screen, big picture experience. 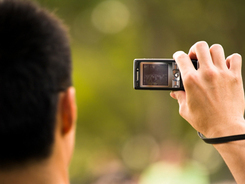 Filmmakers are asked to use mobile phones to shoot and edit three-minute, one-take films. One-take-films are shot without interruption, from the moment of turning the camera on to the moment of turning the camera off. Any text or music must be added using only what is technologically capable with the mobile device. We’ll put all submitted small screen images in our big screen cinema. All films must be submitted on a disc in MP4, M4V or MOV files. All submitted works will be screened. Submissions are due November 8; screenings take place on November 22. Participating in film challenges is a great way to expand your skills, try something new, reach out to other filmmakers and see new work on the big screen! These hipsters are the friends, lovers and fans of Allen Ginsburg, the young gay poet whose 1956 Howl and Other Poems, along with Jack Kerouac’s On the Road (published one year later) created an instant beatnik canon. The movie is an ode to the poem, the poet, and the movement. It was made by documentary filmmakers Rob Epstein and Jeffrey Friedman, which probably accounts for its unusual structure. James Franco is a charismatic and convincing Ginsburg, in a recreated 1957 interview and in flashbacks to the people, adventures and nightmares that inspired Howl. These are intercut with scenes of Franco reading to an appreciative coffeehouse audience, animated sequences, and dramatized excerpts from the surreal obscenity trial of Howl’s publisher Lawrence Ferlinghetti. The trial scenes are a lot of fun, as a parade of expert witnesses (played by appropriately hip actors like Mary Louise Parker and Alessandro Nivola) alternately attack and defend Ginsburg’s work. Subjecting art to cross-examination is unavoidably silly, and as one witness points out, can unintentionally turn individual pieces into historic icons. Capturing the young Allen Ginsberg, as the author did for this month’s biopic Howl, means tweaked ears, a New Jersey accent, and a thorough understanding of what fueled the Beat poet’s masterpiece—and a landmark 1957 obscenity trial. Learn what it takes to manage people, shifts and volunteer responsibilities in this 6-month internship with the nonprofit film arts center Northwest Film Forum. Northwest Film Forum seeks an outgoing, responsible and detail-oriented Volunteer Coordination Intern. This position will act as the liaison between the volunteer corps and staff of the organization, and will work with the administrative and events staff to fill volunteer positions (including admin support, box office/concessionaires, projectionists, other interns, street team and special events). Interns will help design an effective structure for hiring new volunteers and managing existing ones. Volunteer coordination is an essential skill for anyone interested in nonprofit management. This position is hands-on and will provide many opportunities for leadership. Candidates should be able to work independently, be personable and enjoy meeting new people, be comfortable and organized answering email, and be an excellent communicator. This internship is 10-20 hours per week (based on candidate availability) and is unpaid. This is a six-month internship. Hours are flexible but the majority must be worked during regular Film Forum office hours (9-6, M-F), though some evening shifts and work from home may be available for the right candidate. Internship perks include unlimited movie screenings at the Film Forum and $5 for every hour worked toward workshops and equipment rentals. Applicants should send resume to ryan @ nwfilmforum.org by November 1, 2010. We’ve been hearing some great things about about this one. The scuttlebutt is that it’s a quiet, meditative film that gets you lost in its details, and to us, slow and meditative is pitch-perfect for what is apparently going to be a rainy, windy fall. Viewers with a keen eye will even notice that the film takes place over three days, including October 28, the last day it screens at the Film Forum. Perfect timing, eh? With NY Times critic A.O. Scott’s discussion of the ever evaporating line between fact and fiction in documentary filmmaking, I found myself remembering a long conversation I had with James Benning back in 2007 after our screening of his film 27 Years Later. Benning told me of a class he had been teaching at Cal Arts called Looking and Listening. Cal Arts, by the way, was the training ground for C.W. Winter co-director of The Anchorage, a film opening Friday and one that certainly pertains to this post-documentary moment. Benning described specifically how Looking and Listening was a film class where no actual film was shot. It was a class that enhanced his students attention to the environment around them by asking them to heighten these two critical filmmaking senses. For Looking and Listening, Benning dropped his students off at one end of an oil field telling them that he’d pick them up at the other end. During their walk through the field, students were asked to watch and listen to everything going on around them. Additionally, Benning informed them that they had no permission to be on that field and had to talk their way through any encounter with any employee requesting they depart. The traverse of the field was followed by an in class conversation where everyone presented their findings. Benning also recently described the class in a Cinema Scope interview saying he realized that this was exactly the kind of observational approach that Henry David Thoreau had taken for an entire chapter of his book Walden; or, Life in the Woods. Now getting back to The Anchorage, whose central character could just as easily be called Thoreauian, but from a female perspective. The Anchorage, in a very different way from the films that Scott discusses in his article, drifts away from documentary filmmaking, towards a nonfiction feature, but only in so much as the fiction present in the work lends itself towards a nonfictional reading. What do I mean by that? The film merely follows a few days in the life of a middle-aged woman, Ulla, who lives on a Baltic archipelago. For nearly one and a half hours we follow the most quotidian aspects of her life: a trip to the supermarket, gutting fish, swimming, walking around, cooking. And while all of these acts are indeed part of the fiction or story of the film, these same tasks are quite simply a representation of reality that are so utterly bare that I can only describe them as non-fictional. Winter and co-director Anders Edström might suggest this is the result of their trying to create a work that was a cinematic answer to D.W. Griffiths call to action. In Griffiths final interview, his departing wisdom on cinema could be taken as a challenge to filmmaking. He stated that “What the modern movie lacks is beauty – the beauty of moving wind in the trees, the little movement in a beautiful blowing on the blossoms in the trees. That they have forgotten entirely…. 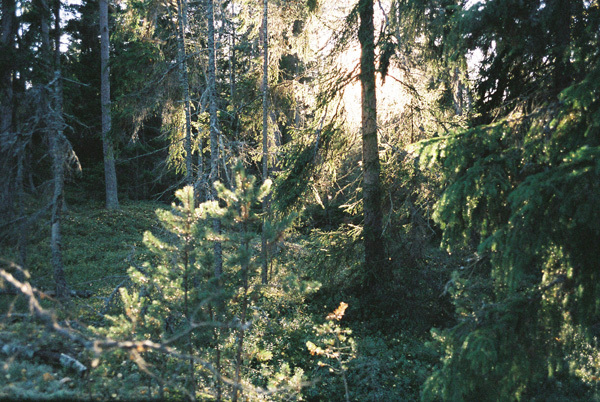 In my arrogant belief, we have lost beauty.” And what The Anchorage has in spades is the wind blowing in the trees. In fact it is one of the stronger documentary elements of the film. I believe Winter and Edström were making conscious attempts to concretely bring wind as a material object to the screen along with the pastel leaves, the choppy water, and the massive volcanic rocks that Ulla crosses each morning on her way to her ritualistic bathing. Fortunately for Seattle audiences we’ll have a chance to discuss this blurry fictional/non-fictional line in detail when C.W. Winter attends screenings this weekend. He’ll also be offering a historical perspective on observational narrative in his one day workshop Any Time Whatever: A Partial History of Looking in Narrative Cinema. I hope to see you at both. I’m sure we’ll have an engaging conversation no matter what. With any $10 purchase, all Film Forum members can get a FREE bowl of delicious white truffle popcorn. Perfect for taking to a post-drink movie next door at the Film Forum! Just remember to present your card at time of purchase. 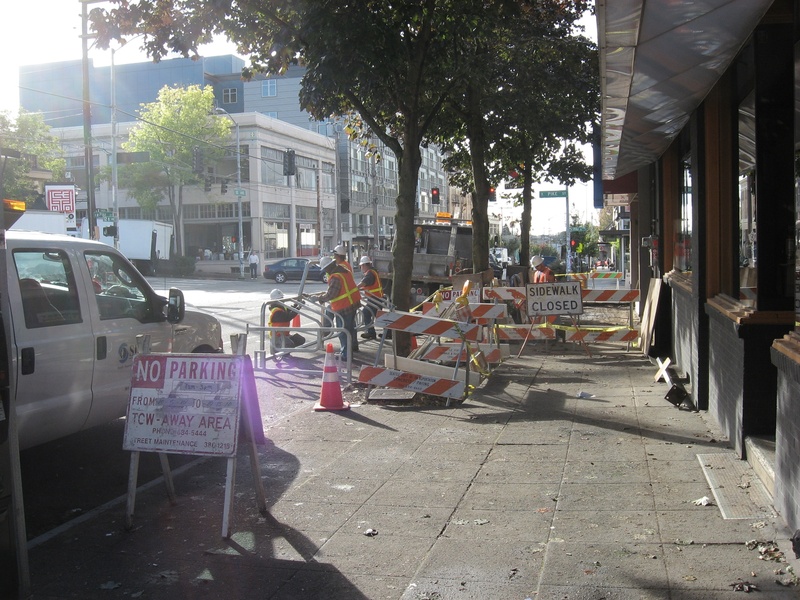 Hey, what’s that they’re working on in front of Northwest Film Forum’s sidewalk? Well, what do you know! It’s our long-awaited BIKE RACK! A few years ago while attending the International Film Festival Rotterdam, I watched the world premiere of the Dutch made documentary BABAJI, AN INDIAN LOVE STORY. At this screening I was privy to an odd series of announcements springing forth from what I assumed was part of the soundtrack. Somewhere beneath the conversation of the elderly Indian subject of the film and the ambient sounds of his bucolic back yard came proclamations of “Rook to Queen’s Pawn Six.” and “Rook To Queen’s Bishop Four”. At first I believed these strategic announcements of chess movements to be the filmmakers sly commentary on the images that flickered across the screen. However, as they began to lose synchronicity with those images, there was no mistaking the trouble with the picture. Yes the likely overworked projectionist must have some how hooked his computer into the house audio system, forgetting to remove it after starting the film. Once he started the screening, he also set about to finish his chess game, whose sounds and moves shrieked through that same system creating a brand new audioscape for the film, one completely different from the filmmakers intentions. And while this mistake was made all the more troublesome by the fact that the filmmaker was present, a world premiere screening, and that this was in the filmmakers home country, it was just one in a series of exhibition disturbances I’ve experienced at a film festival or film venue. Year after year, there are rumors of similar glaring omissions, screening failings, or videos in place of film prints occurring at one or another festival in our very own city. Annoying as these are, they’re common enough that the audience begins to lose sight of their impact on the screening experience. We’ve often encouraged audiences to reverse this course by voicing their concerns at screenings. Come out to the lobby to inform any staff at any theatre of lapses in exhibition quality. Moreover we encourage film venues to make announcements to the audience of such problems as they arise. We know they’re inevitable in this business regardless of whether its a festival or a multiplex. So it was a troubling surprise this afternoon when I answered the phone to hear a patron on the other end first informing me of an egregious error that occurred on one of our screens Saturday evening. During our presentation of Gaspar Noe’s already disturbing ENTER THE VOID, our projectionist completely missed the final reel of the film, leaving our viewers with the feeling that the film ended with a rather uncomfortable abortion scene. And while any seasoned filmgoer knows that we take great pride in the presentation of our films, taking all appropriate steps to assure that our films are screened in their entirety, at the appropriate sound levels, with appropriate aspect ratios and that an occurrence like this is an anomaly that we assure you we’ll avoid in the future, I am quite aware of the impact such errors leave on the audience. We’d like to apologize to our viewers for leaving them with a less than satisfactory and frankly incomplete viewing experience. We strive to present you with films in their intended screening formats, in the manner in which their filmmakers intended for them to be seen. While we know this message won’t reach everyone who attended the screening on Saturday, we want to extend an offer to anyone out there who was in attendance that evening to return to the theatre tonight or tomorrow on us. The screening for those patrons will be free. If by some chance you can’t make it, we encourage to print this email out and present it sometime this month for free admission to any of our other films, excluding the Seattle Lesbian and Gay Film Festival, who operate their own box office. I hope that the forthright nature of this message engenders a certain respect in return. In other words please don’t abuse this offering. We regret our blunder and hope that this type of lapse in exhibition quality never occurs again in our theatre.